It was an almost forgotten advent tradition. The phone call to Land's End. I used to be a major catalog shopper, back before I was a major internet shopper. One year, I called Land's End and ordered three monogrammed stockings. Two years later, new baby at my breast, I called again. And then again. And again, every two years, until there were seven. Last year, I hung those stockings and thought with a twinge of sadness how perfectly they fit in the spot we'd chosen--no room for another. A month later, I was pregnant! So, this year, I ordered a stocking for Karoline. But I ordered the one with the snowmen and not the angel. The girls learned of this mistake and protested loudly. Apparently, the family tradition is that the girls all have stockings with angels. 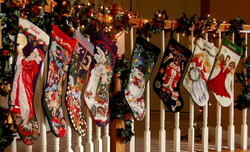 I didn't know that two stockings made a tradition. Seemed like a nice tradition, though. So, it turned out that I had to make a phone call after all. And the very kind lady on the phone said, "A baby at Christmas! How lovely!" I kid you not--after a year of blogging loveliness permeating this pregnancy, she said "lovely." Lovely. And the whole conversation reminded me of this column, written in 1999. It was the weekend following Thanksgiving. My husband was traveling. I had nearly finished my Christmas shopping. And I had spent a couple of hours on the phone, bouncing back and forth between various members of my extended family; the first of several rounds of Christmas coordination calls. I was trying again to plan our Christmas celebrations, taking into account the visitation schedules of siblings and step-siblings. I was determined to have the perfect Christmas this year: everyone together to celebrate (except those who wouldn’t be civil to each other) and a revival of some fond traditions of childhood Christmases (without stepping on the toes of people who have found new spiritualities). In my mind, all these criteria could be met. This could be perfect. I hung up after round one, my head and neck tense, my soul weary. It didn’t feel remotely like Christmas and I had serious doubts that it would this year. I had one more call to make before I would call it a day. I needed to order a stocking for Stephen’s first Christmas. All my children have monogrammed needlepoint stockings and he would too. I called the catalog company and placed my order. "And I want to have it monogrammed," I said. "What should it say?" inquired the calm voice on the other end. "Stephen," I replied, tears springing unexpectedly to my eyes. "A baby at Christmas," she said. "That’s what it’s all about isn’t it?" In this space over the course of this year, I have reflected often upon how Stephen has shown me that God is bigger. He is bigger than any plan I have and He is bigger than worry or anxiety. I am a planner and God has shown me this year that only His plans are the perfect ones. Thoughts of Stephen at Christmas brought thoughts of another Christmas baby. I am quite sure that Christ’s birth wasn’t exactly the perfect Christmas Mary planned. I cannot even imagine a donkey ride nine months pregnant, in the throes of early labor. Caves full of animals stink. Hay makes me sneeze; I wonder if at least one person gathered on that night wasn’t wheezing. And in the tired, hazy, sweet hours after childbirth, when most women want to rest and just gaze at the fruit of their labor, the holiest woman of all was visited by smelly, dirty strange men and their sheep! The Blessed Mother was truly the ultimate gracious hostess. Exactly who is coming for Christmas? The Son of God. I think that I am the perfect hostess called to juggle the needs and wants of competing interests. I think I have to find the perfect gift for everyone on my list and wrap it in the perfect paper. I think we need to stick to the traditional twelve course Italian feast or I will disappoint my late grandmother. (Truth be told, my grandmother would have been so thrilled with all my children, she wouldn’t have cared about food at all.) I think I have to have a perfectly decorated house that smells of Christmas, despite my asthmatic children. Advent isn’t supposed to be a marathon of materialism and merrymaking. Christmas isn’t also known as "the feast of cooking, cleaning, and shopping." Christmas is a time to be Christ to one another. It is permission in a largely secular society to witness to the wonders of the Lord. In reality, the only thing perfect about Christmas is the Christ Child who longs to find shelter in our hearts. I am not Martha Stewart. I am an innkeeper. I am preparing a place in my home and in my soul for the Savior of the World. I need to be so grounded in prayer that Christ’s peace overflows from me to those in my home. Let the visitors come. Let them come whenever they want and stay as long as they want. I will make the house warm and the food filling, but above all, I will make certain that the Holy Infant is here. He will be the reason for our celebration. If He can cause the lion to lie down with the lamb, He can handle Christmas at my house. Despite all the other things on my list, I must make time for earnest, fervent prayer, because I know that I can’t do this under my own strength. I must invite the Baby. The only perfection here this year will be the Baby. Because a Baby at Christmas is what it’s all about.